very nice snake how large can they get. Seeing as you have an extensive knowledge in snake husbandry.I am struggling to find reason why you have gone from keeping a corn snake then on to a annaconda. I am very curious as to why you chose the conda and not a reticulated python?? The Yellow Anaconda gets nowhere near as big as a normal Retic so they are actually generally more practical than your average Retic. And they are so much more attractive than green anaconda. Nice snake. "I don't trust anything that bleeds for five days and doesn't die"
yeah the retics are much, much bigger and this conda is a male so will average about 7-8 foot. they are also more slender bodied than retics and do actually calm down a bit. I think of the yellow anaconda as a more aggressive red-tail. a retic can reach 25'+ whereas a 10' male yellow anaconda is considered a very big specimen. so a yellow anaconda male is about a third of the size of a retic and a hell of a lot less dangerous. Very well but I did not ask for the info as I have been keeping reptiles over 20 years now. Thank you regalis, although what was said did really put me off and made me paranoid. I didn't think the anaconda was that bad, I had him out a few times and he didn't try to bite me or anything, he was just preoccupied with looking around. It was only when he was sat in his viv that he was aggressive and so the biggest problem I faced was getting the water bowl in without getting tagged. I took him back to the shop as I was really paranoid. I think it is important to remember that experience isn't everything as I find sometimes people can get too cocky and so become complacent when dealing with animals and so can be just as likely to be tagged as less experienced people. 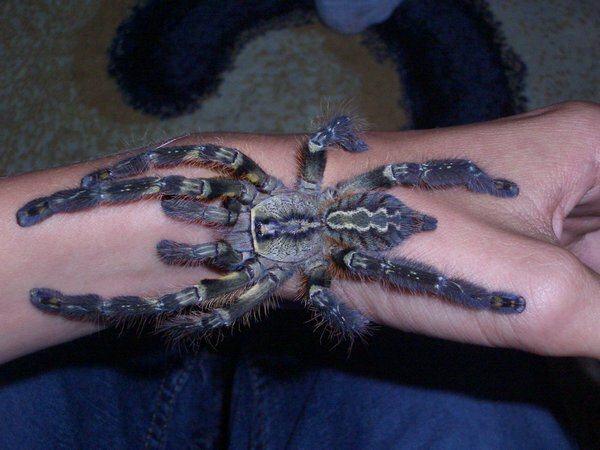 My third T was a T.blondi and my sixth and seventh were P. regalis and a singapore blue adult females. I have not been tagged yet by them despite only have been in the hobby for 4 months. I have a lot of respect for animals and am always very, very cautious around them until I can get used to their personalities and even then I am still hesitant to become slightly relaxed around such animals. It was only when he was sat in his viv that he was aggressive and so the biggest problem I faced was getting the water bowl in without getting tagged. I took him back to the shop as I was really paranoid. I think you did the right thing returning the snake to the petstore. It's best to do research on animals before you commit yourself to keeping them. I think the petstores are to blame as they will sell anything they can.In a perfect world they should be checking that the buyer is fully aware of what the animal is capable of doing etc. I think we all need to calm down a little here! I agree that Brad, you may have bitten off more than you can chew with a snake of that size and with the housing and handling requirements that anaconda would need, so did you really take it back to the petshop? If you did, at least you're not like some morons who will get it, keep it in a petpal and think it's hysterical (or more likely 'cool') that's is an aggressive ****er whenever you try and do anything with it! We all know there are people out there that do this! I think it's easy to get carried away when you visit a pet shop, you have money burning a hole in your pocket, but Brad, if you did take it back, at least you were man enough to admit you couldn't deal with it! I'm the worlds worst for buying on a whim (hey, I'm a girl! ) but I like to think that everything I own is looked after, fed, housed properly, and treated with respect! I bow down to people with far more experience than me with keeping both reptiles and Ts, and I am fortunate, very fortunate, that I have a lot of contacts who do have that experience and I can turn to them in times of need! There's a difference between a 'text book' answer, and someone who's been there and got the Tshirt! Brad, try something more suitable, like a Retic next time....Joke! hey Jo, long time no speak. Hows things? Yeah I agree with what you said. Thought i'd try give it a good home but not quite up to the standard yet lol. he wasn't actually all that bad once he was out of the viv it was just working around him inside. gonna be getting a red-tail soon though which will be kl. i did take him back, traded it back for a miami corn. hows your green tree python? you been bitten yet? Don't worry about the Anaconda, I think you did the right thing to be honest, I mean, better that than you struggling and both of you being miserable about it. Corns are cool though, easier to house and stuff too! Don't get stupid big like my bloody Burmese is now! She's growing like a weed. Grown about 3-4ft in 6 months! She's ace though, great fun and a nice snake, just ordered her a new viv too so she'll have more space again. I think when she's full grown, I'm going to feed her Chavs! GTP is fab, he's a little gem. Yes, he had me a good few times when I first had him but he's way more chilled out now. I will open myself for a slagging off now when I say I handle him, but I tend to do it when he's on his way round the tank, so I'm not forcibly pulling him off his perch. He comes onto my hand happily enough and doesn't snap at all anymore. I rarely handle him though, don't want to stress him. It's usually when I'm cleaning him out, if he's mobile, I test the water, if he's not happy, I leave him on his perch! The Ts are all doing fine, the blondis I got from Craig have matured so going to have a go at breeding in a week or so... Very exciting! Good decision to take it back. It obviously wasn't young and you probably inherited the previous owners reasons for selling him. I've always found it best to start with young Boas & Pythons. I'm just getting back into the snakes after a four year break following a family illness and i've just got a CB08 male Burm. I like to watch them grow and get to know them before they get big. I have purchased some really large adults in the past and trying to second guess the nature of a big unfamiliar python or boa can be daunting. As for some of the stupid things said earlier i have met plenty of "20 year plus plonkers" in my time and their arrogance normally means they are bad reptile keepers. good to hear they are all good. my blondi has jus moulted and is a female, she is really big now. the burmese are quite cool but im more fond of boas to be honest. You going to exhibition thiss year? Hi ya, yeah, I was a bit worried when I first said about the experience thing as i didn't want to imply that i thought this way accross the board and i do realize that experience is important; but yeah definetely, there are so many complacent 'experienced' people out there that they are just as bad as those who know nothing about their animals. sorry to hear about the family illness. Are you trying to say that I am a bad reptile keeper? It was obvious the guy had bought someone elses problem in the snake so he did the correct thing and returned it. Damien, I know it seems as though I had been targeting you with this original statement but i really havent meant to direct anything. All I have been trying to say is that experience is something that, whilst on the most part a good thing, may not always be and sometimes can be trusted upon too much when you do not know the person. Whilst I know I was not up to standards, I thought it was somethng I would be able to adapt too but obviously I was wrong in this case and maybe I should just stick tot he spiders for a while longer lol. I really dont want this hostility to carry on and I hope thiis can be put in the past and a mutual apology for the things that we have both said as i think there have been hostile things said on both parts. I am sorry on my part. What i said about the "20 year" thing was not directed directly at you but you really seemed to be going for Brads throat. I'm sure your a good keeper. I've got about 15 years experience, mainly with snakes but i am always open minded and i am always ready take on tips and advice from anyone no matter how experienced they are. I haven't been keeping T's for long and some of the advice i have got from this forum has been invaluable. Thanks for your kind words. My son was diagnosed with leukemia four years ago. At the time i had a large collection of snakes including several breeding projects. I was forced to clear the lot not only for my sons sake but theirs as well. The two main factors were the risk of Salmonella poisoning for my sons sake. Also i virtually lived in the hospital with my son for 18 months leaving me no time to look after my snakes. I got into the T's about a year ago as my sons condition improved. I now have a decent little collection. The really good news is that my son has made a full recovery and is in complete remission. The kind words i have received from people like you and Johanna on this forum really makes me feel good to be back in the hobby. Good luck with your future projects guys . but i would not think a jump from a carn to a yellow is a good idea!!! male morh burm would have been a better idea but as yellows are very cheap they get sold and passed from post to post till they die!!! !